With XTERRA just a week away and a business trip to the Philippines to do during the lead up to the race racing the weekend immediately before the biggest race of the year so far for me from both a participation point of view and definitely the biggest in terms of an organiser's perspective was neither ideal or planned. However, with the discovery of this bevy of biking events happening in my own backyard the temptation was just too great to resist so in support of this great local initiative by Amir the event organiser I cycled over with Elsa and I signed up for 3 of the 10 events scheduled over the weekend. This consisted of the Ride and Run (R&R) Race which was going to be my “A” race as it was a ride and run using Mountain Bike’s and not only suited my training programme , it had 3 age groups and I was placed in the “Gold” category aka ‘The Golden Oldies’ (45+) as one of my young Mate’s so nicely put it :-) More fun, support & experience I also entered 2 other race formats that I had never done before namely the Tambun Crit and the Gatebridge 4X. 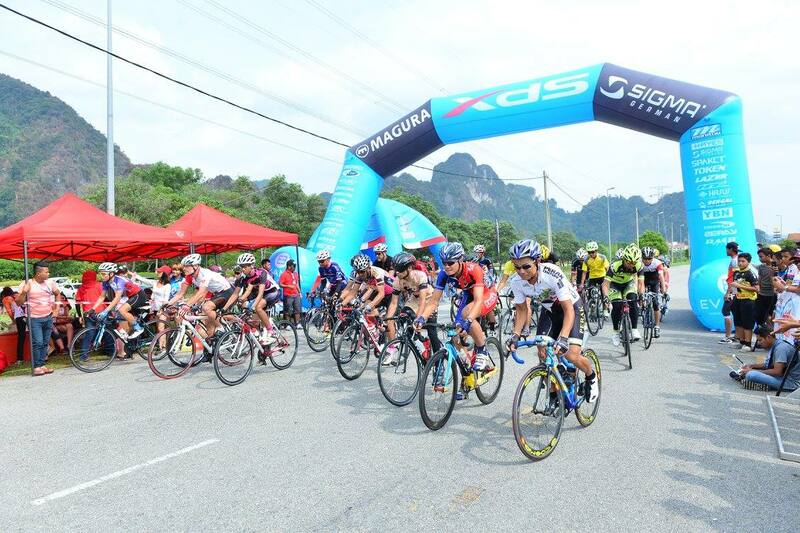 The first, the Tambun Crit, eventually took place on Saturday afternoon after a scheduled morning start. It was supposed to be a 50km criterium race but it was shortened to 30km. Just like the race, I’ll keep the report of this race very short too. As, not only was the race distance shortened dramatically so was my participation in it. This was thanks to the lead team of young racing snakes who smashed the field to pieces and lapped me after only 7 (or was it 6s) of the 2km laps. I’m grateful for the experience though and for these Lad’s humouring me for the first 2 laps when they allowed me and a few others to get in the mix until they’d warmed up and put on the after burners and proceeded to tear us to pieces. 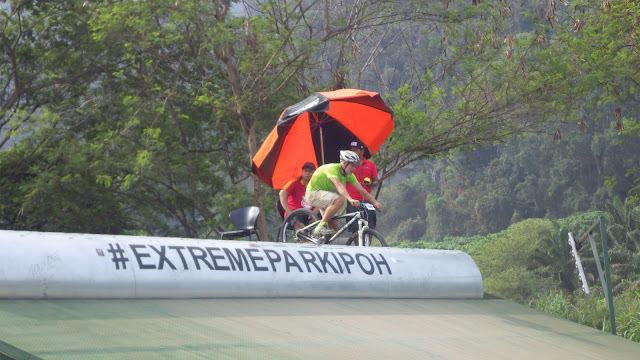 From the closed road circuit at Tambun I cycled home to pick up my MTB and went to the Extreme Park where the heats for the Gatebridge 4X event were taking place. 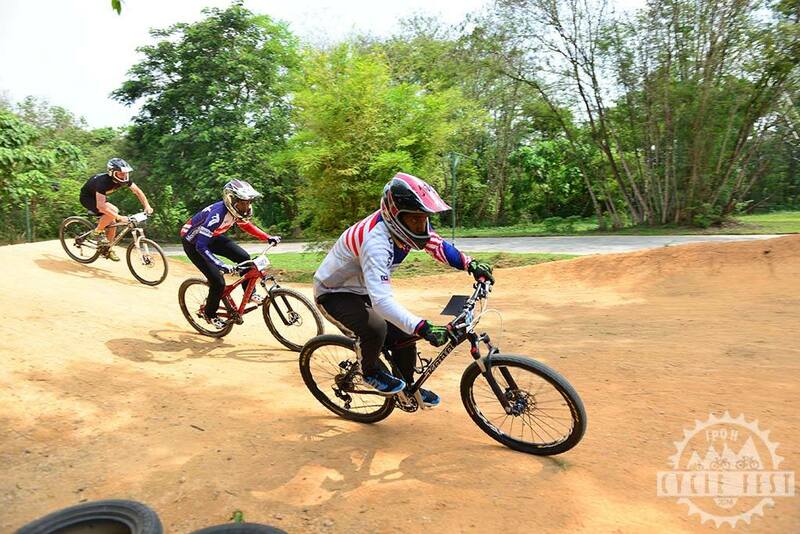 This was to all intents and purposes a BMX race event. The word Gatebridge is the elevated electronic/hydraulic starting block used to start the races and the X4 refer to the maximum number of racers allowed to race on the short but technical BMX track. After watching how the young kids flew over the humps and bumps so effortlessly I was relieved that Amir and his Organising Committee had had the foresight and good sense to have a seniors (over 40) category for this race format as, somewhat like the criterium, these kids were in a totally different class although in fairness they were riding proper BMX bikes designed for these tight bumpy tracks. Never being one to be afraid of the deep end I dove in and gave it a go and discovered to my horror after a few tentative practice laps that trying to take jumps fast and specifically land them was like most things in life, a skill that needs practice prior to perfection. My claim to fame during this open practice session was to have the highest rated wipe out of the afternoon of anyone and my gravel grazes versus road rashes were evidence to this ;-). I was somewhat fortunate though that my one shot timed lap was good enough to placed me in the top 4 racers and, as a result, I qualified for the best of 3 race finale on the Sunday afternoon. Following this I cycled home to lick my wounds over my obligatory Saturday evening Carlsberg & Guinness mix and ready myself for the next days adventures that began pretty much at first light with the R&R Race which consisted of a 40km MTB bike ride and was followed by a 5km run. On arrival I was greeted with a MTB Jamboree like crowd. This was encouraging from the organiser's perspective, as the previous days events had not been so well attended. On the other hand, it was bit of pain from my racing aspirations as having the race so close to home I had clearly been a bit too relaxed about getting over to the start line and found that trying to get into a pole position for the flag off was going to be impossible. 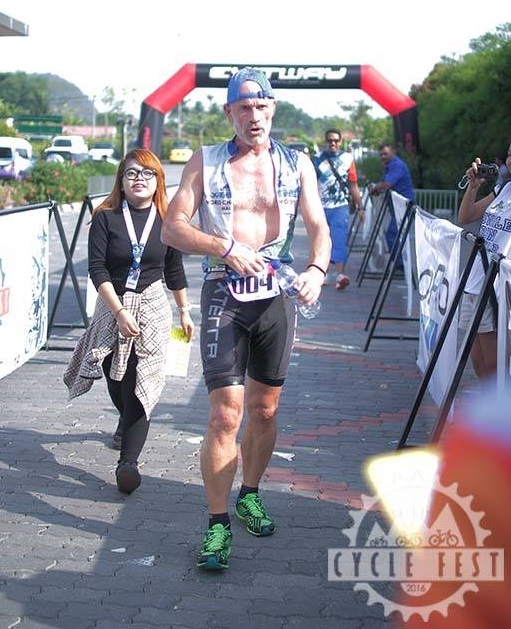 Amongst all the other biking friends it was especially good to Razani, one of Malaysia’s greatest triathletes who despite having just turned 50 still looks as fit as a Butchers Dog. There were I confess some mixed emotions around his presence. As, as lovely as it was to see him with him being in a different league to me I knew that the challenge that other friends had set me of being ‘numero uno’ at the race now had to be recalibrated to 2nd at best. This sounds a bit defeatist doesn’t it but as aspirational and optimistic as I am and as I encourage others to be about what they should shoot for we all need to have a solid grounding in realism. 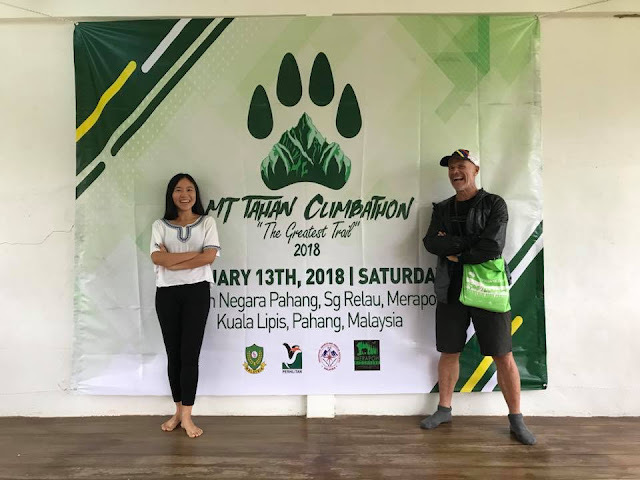 Anyway, full credit to Amir and his team, unlike yesterday’s waiting around there was clockwork precision as the R&R Race got flagged off on time and the 500+ riders rolled out onto the road heading towards Tanjung Rambutan & the trail head. Not having the prime position at the start line wasn’t so important with just over 4.5km of road to ride on before the trail head began. There wasn’t any time for complacency though as given where I was I had to work hard to get in contact with the lead group. Fortunately, Razani with his usually distinctive orange running singlet that he races in was clearly visible and I was able to negotiate the traffic and slot in on his back wheel and catch my breath. I even allowed myself time for a little breather and could relax and chat with the lead peloton including Razani. 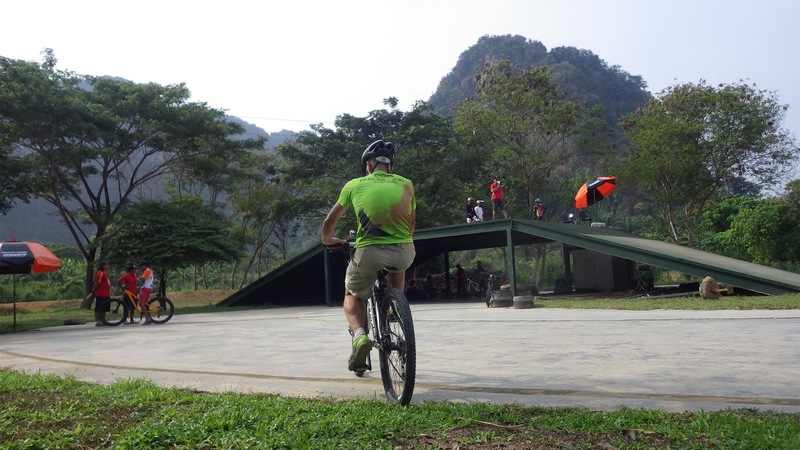 As, as soon as we hit the trail and the 1 st climb he put his “metal” to the “pedal” and mine to the test and pulled effortlessly away to join the like’s of Saiful and Shahrom and the other lead riders. 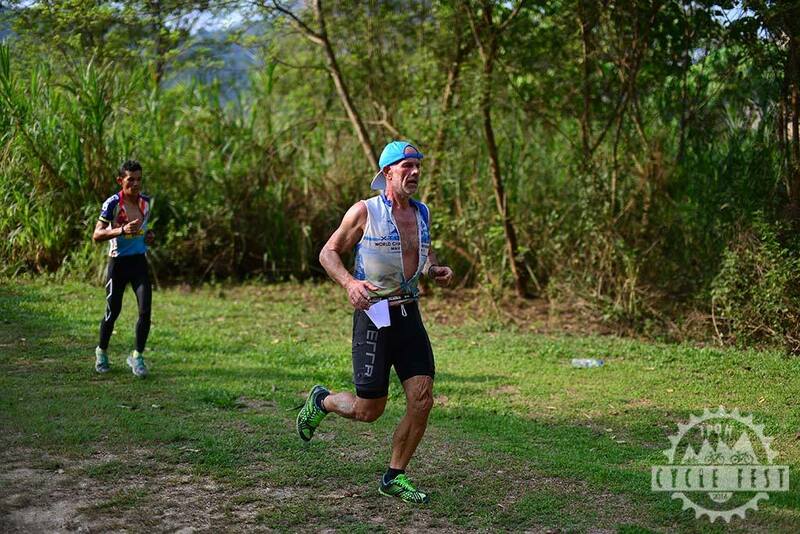 The next time I saw him he was 1km+ in to his run and not far behind the outright leaders. Not being sure of who else was actually in the “Golden Oldies” category and therefore who was either around or ahead of me in terms of other competition for the remaining podium places there was nothing else to do but to focus on my own race and riding as hard and as fast as I could. Despite never feeling that I’m climbing as well as I should/could, on reflection, given that I was passing more riders than were passing me I started to sense that I was holding my own and the priority was to therefore stay safe and ride clean on what were some fast but not too technical descents. Eventually we looped round through the hillside plantation and eventually popped out onto a very newly tarred road that I’ve subsequently learned leads up to Kg. Choi. We headed down this road so bike skills and accurate and fast cornering was the order of the day. After a sharp left turn just after the road returned to hard packed gravel and mud we climbed once more before descending down a very technical descent to arrive at the back of the Sunway residential development where we had about 1km of road to return us back to transition and our running shoes. I was still in the dark as to my position but I was happy with my incident free ride and was looking forward to the run that turned out to be flat as a pancake and mostly on the road. Despite usually finding that running on any road makes time drag for me the run actually seemed to be over very quickly as before I knew it I was crossing the finishing line and despite being well and truly humbled by Razani I was confirmed as finishing in 2nd place, which I was more than happy with. 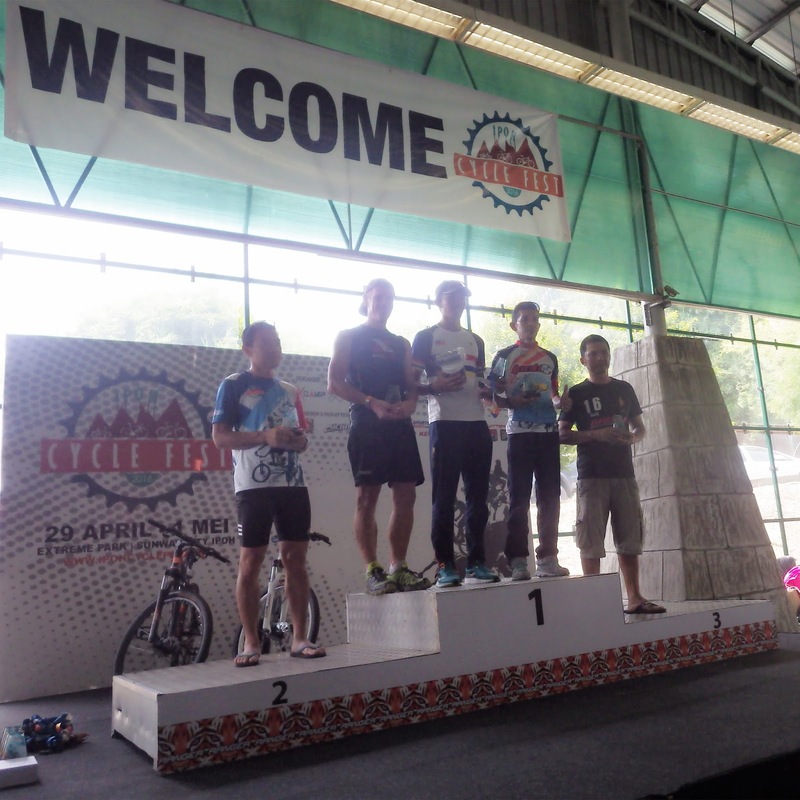 Turns out that Tang who I had raced against up in Penang was also in the hunt but according to him, he’s not much of a Mountain Biker and whilst he ran strongly to finish in 4th place. After cycling home and washing myself and my bike and then re-fuelling I headed back to the Extreme Park on my old faithful Scotty Scale Hardtail to finish off the weekend’s fun with the Gatebridge X4 finale. This turned out to be somewhat like the last day of the Tour de France e.g. processional rather than competitive. As with only 3 of us showing up for the finale and me being the oldest and clearly the slowest after the 1st round I pretty much just had fun trying to learn and catch Ahmad Asri (the eventual and deservedly so winner) and Sanusi (who was a comfortable second).